Not surprisingly, the project’s rollout received widespread media coverage featuring little scrutiny and many important factors left unreported. That noted, here are four things you need to know about this project and the extensive media coverage it’s received, as well as EDF’s past methane research and methane emissions in general. What the NYT fails to mention is the fact that the National Academy of Sciences (NAS) report actually recommended regulators use a combination of facility-level (bottom-up), aircraft and tower measurements (top-down) and satellite measurements in order to improve accuracy of methane emission inventories. Why? Because satellite measurements have significant limitations, as the NAS report discussed in detail. The previously linked media reports on EDF’s announcement almost breathlessly tout technology that would seemingly address the satellite limitations listed above and usher in a new age of absolute certainty on the methane emission data front. EDF doesn’t hold back on the hyperbole, either. High-tech stuff, no question. But it is important to emphasize that, by EDF’s own admission, some of the technology discussed in the media hasn’t been fully developed yet. In other words — this is a work in progress. Along with the fact that the actual launch date of the satellite is likely two years away (EDF says it won’t actually “lift off until 2020 at the earliest”) it is clear that the hype generated by this project may be a bit premature based on the long road ahead on the technology-development front. The project, which will rely entirely on financial contributions from a “coalition of philanthropists,” has also yet to be fully funded. But what is actually important — and woefully underreported — is the fact that each of those EDF studies found low methane rates well below the 3.2 percent threshold for natural gas to maintain its climate benefits. 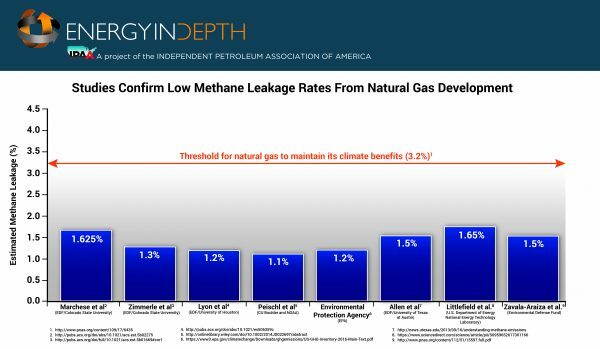 Five of those studies are featured in the following EID graphic illustrating the most prominent research showing low leakage rates from U.S. natural gas systems. Here is what the above-listed EDF studies found. Allen et al. (Leakage rate: 1.5 percent): This landmark 2013 EDF/University of Texas study was the first to measure actual emissions, and it found emissions “nearly 50 times lower than previously estimated by the Environmental Protection Agency,” confirming beyond a shadow of a doubt natural gas’ climate benefits over coal. Activists have attempted to discredit this study by claiming the use of a potentially malfunctioning measuring device by the researchers led to an underestimate of emissions, but that claim was recently debunked by an independent EPA audit. UT and EDF followed up with two more studies, which also found very low methane leakage rates. These studies concluded that methane emissions from the upstream portion of the supply chain are only 0.38 percent of production. That’s about 10 percent lower than what they found in their 2013 study. Lyon et al. (Leakage rate: 1.2 percent): Using “top down” measurements from aircraft over the Barnett Shale in Texas, this 2015 EDF/University of Houston study found very low leakage rates, despite the fact it was a “top down” study with the significant limitation of being unable to attribute methane detected to other potential sources, such as agriculture and natural seeps. Zavala-Araiza et al. (Leakage rate: 1.5 percent): This 2015 EDF study analyzes data from 12 previous EDF Barnett Shale papers and finds low methane emissions despite being, as the report puts it, “biased toward high-emitters.” Notably, a recent NOAA study reveals the “super-emitter” data Zavala-Araiza et al. relied on used air measurements likely collected during episodic maintenance events, which skewed emissions higher than they typically would be. As a result, these “peak” emissions data were inappropriately used to calculate a normal emissions profile. Zimmerle et al. (Leakage rate: 1.3 percent): This 2015 EDF/Colorado State University study finds low overall natural gas system methane leakage rates based on 2,292 onsite measurements from transmission and storage facilities along with additional emissions data from 677 facilities and activity data from 922 facilities. Each of these EDF studies found leakage rates in the range of 1.2 and 1.6 percent, which is notable considering they were generally regarded to be the most comprehensive studies of their kind at the time they were released. Each is also in line with U.S. Environmental Protection Agency (EPA) estimates and well below the 3.2 percent threshold for natural gas to maintain its climate benefits. 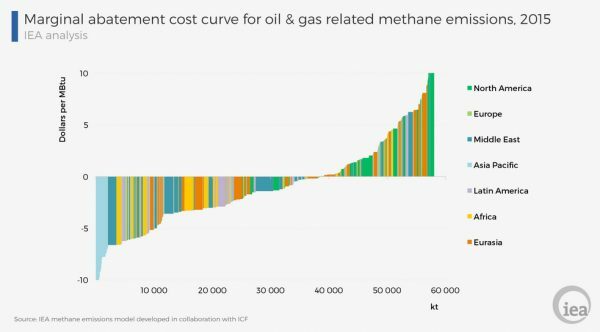 That said, the International Energy Agency (IEA) also notes that the most cost-effective methane mitigation opportunities exist outside the U.S., as this following IEA graphic shows. The reason is simple: according to almost every reputable third-party account, U.S. emissions of methane (CH4) from oil and natural gas development have been declining in recent years, thanks in large part to technological innovation. From 1990 to 2016, methane emissions from petroleum and natural gas systems declined by 31.5 million metric tons of carbon dioxide (CO2) equivalent, or nearly 15 percent. Over that same period, natural gas production increased by 50 percent, while oil production increased by 21 percent. This methane mitigation success is reflected not only in EDF’s studies, but also EPA and the Global Carbon Project data (which was referenced in the aforementioned highly regarded NAS study), which show U.S. oil and natural gas methane emissions account for only 1.4 percent of all methane emissions worldwide. U.S. oil and gas system methane emissions also represent just 10.5 percent of the world’s total oil and gas methane emissions, even though we are the largest oil and natural gas producer in the world. 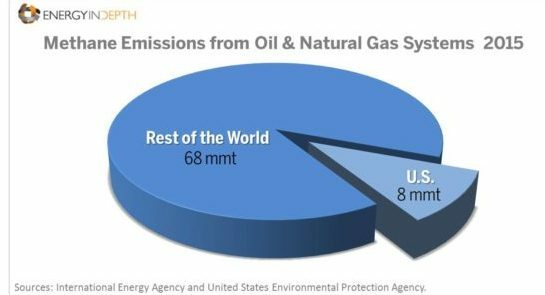 In other words, even if claims by EDF and virtually every other environmental group that U.S. oil and gas methane emissions are underestimated — they are almost certainly not a significant percentage of global emissions. But despite the fact that the U.S. oil and natural gas industry is leading on the methane mitigation front, EDF plans to focus the early stages of its satellite study on the U.S. One would think that if the effort were truly about reducing greenhouse gas emissions and mitigating climate change in an urgent fashion that efforts would focus on regions of the world where methane emissions are not only believed to be more prominent but also more cost-effective to reduce. EDF has a relatively solid reputation compared to other environmental groups, which is based largely on its comparatively pragmatic stance on fracking and natural gas, as well as its willingness to work with industry on methane research. But the fact remains that EDF is an environmental non-government organization, meaning its methane satellite project should be met with the same skepticism that industry-produced work would be by the media. Whether or not that will actually happen remains to be seen.